Bamboo is an alternative of using sticks, and are commonly found in plain biome. Bamboo can be broken with anything, but using an axe will speed up the process. Rafts drop bamboo when broken. Bamboo spawns in mountain, plains, and forest biomes. The bamboo block can be crafted back into four bamboo. Bamboo can be used to fuel a smelter, although they don't supply as much fuel as coal would. It can also be used in any crafting recipe that might otherwise require sticks. Since bamboo grows much quicker than trees, they are easier to collect and use as sticks. If you break the base of the bamboo, or the block below said base, all bamboo on top will break too. 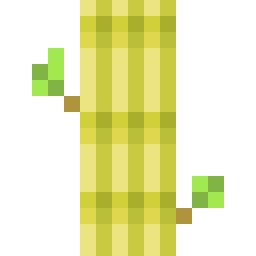 If bamboo does not have dirt, grass, or another piece of bamboo below it, it will drop as an item. Six pieces of bamboo are required to craft a raft. The bamboo block is crafted using four bamboo. Bamboo can replace sticks in any crafting recipe, so there are many other uses for bamboo. If an ore or stone is generated under the bamboo during world generation, it will break into drops when the player loads the area. The old texture of bamboo. This page was last edited on 25 January 2019, at 19:00.